Bein' Green IS Easy! Can you help me spread the word that Norwex products make your home healthier AND your life simpler? As I was following a rabbit trail on Pinterest (don’t pretend you don’t know what I’m talking about!) I came across this article on how to clean your mattress. 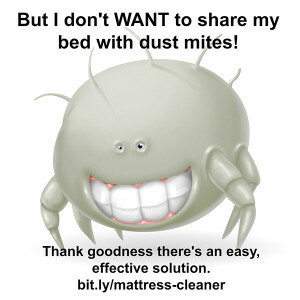 Now I completely agree about our pillows and mattresses being “the ideal breeding ground for bacteria and dust mites.” But thank goodness there’s an easier way than dragging it outside and beating on it! Norwex Mattress Cleaner is an enzyme spray that “digests” the allergens in our beds, just like enzymes in our body digest our food. Dead skin cells are what dust mites eat. You probably didn’t WANT to know that you shed enough skin cells every day to feed a million dust mites. But the most harmful allergen found in our beds is the, uh, after-effect of dust mites eating. You know, their poop! Did you know that’s mostly what we react to when we’re allergic to dust mites? Preventing dust mites is tricky. Lots of us have tried special covers on our pillows and mattresses, but the New York Times reported a study showing that those aren’t as effective as we would like. Norwex Mattress cleaner is NOT a pesticide. It’s not a chemical that kills anything. Because we wouldn’t want to breathe in a toxic chemical all night any more than we want to breathe in dust mite poop! It simply works its way through your mattress “eating” away the allergens, converting them to carbon dioxide and water. It’s not just for mattresses! Spray on pillows, comforters, stuffed animals, upholstered furniture, vehicle seats, and pet beds. A light mist will do it – about two sprays per pillow, and 12-15 sprays on a king-size bed. Allow to dry before putting on clean sheets. For severe allergies, spray once a month. Otherwise every 3-4 months is fine. So one bottle lasts a year or more! The most amazing testimonials I’ve received from my Norwex customers are about this product. Husbands who’ve stopped snoring, kids who’ve stopped coughing at night, moms who are able to wear contacts because their eyes aren’t dry and itchy, people who don’t sneeze multiple times every morning anymore. I personally ALWAYS travel with a samples-size spray bottle of mattress cleaner for hotel room beds! Who do you know who needs some desperately?